So near and yet so far… – …STILL CRAZY AFTER ALL THESE YEARS! …is very near my house but I had never stopped by to check it out like it was so far away. As a matter of fact, it is located in a block of around 3 shops, a car workshop at the other end, an electrical shop in the middle and this coffee shop is on the left. We would drive past everytime on our way home from town and I do go to the car wash place at the corner house at the junction of this lane, Jalan Au Yong Selatan, and Jalan Pahlawan, just a stone’s throw away, quite frequently. It did look kind of quiet before but ever since somebody opened a tuition centre upstairs, business seemed to have picked up quite a bit and I often see quite a lot of people eating there. Being in the midst of all the residential houses in the area, it would have been quite a nice spot for people staying around there to gather for coffee and to chit chat but of course, these days, smoking is not permitted in coffee shops anymore. I wonder how much this ruling has affected their business, if at all. 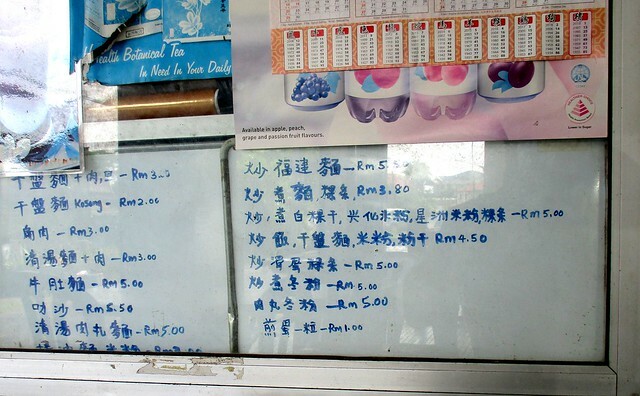 …that I had was RM1.70 a glass, a little cheaper than most places around town and it was all right, not the best but definitely, there are others a lot worse. …was completely in Mandarin and that’s Greek to me even though I am quite conversant in the language these days. That, of course, is anytime better than plastic! …was served in a melamine plate though – I did read somewhere that it isn’t much better than plastic using that to serve hot foods. I do prefer this pattern though, a whole lot nicer than those plastic ones in the horrendous gaudy colours, red, orange, green and what have you. As a matter of fact, many Chinese restaurants and chu-char (cook & fry) places here use this same collection of melamine plates, this same pattern, to serve the dishes. 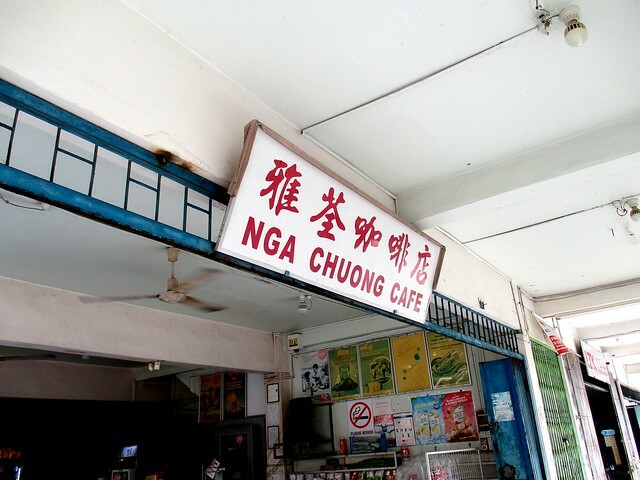 NGA CHUONG CAFE (2.312134, 111.837763) is located along Jalan Au Yong Selatan past Lorong Au Yong 4 on your left as you turn in from Jalan Pahlawan. 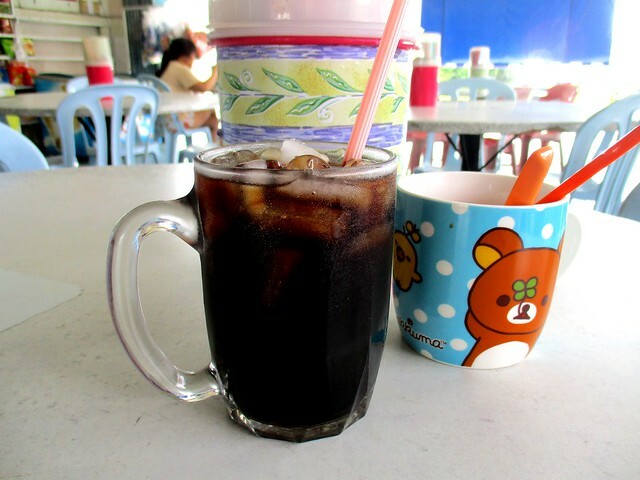 Seems the kampua mee and drink is passable. Did you visit this shop this time out of curiosity after so many years? It was because lately, I saw quite a lot of people eating there – it used to be quite deserted…and yes, both were ok, nothing sensational but definitely better than some that I have had around town. 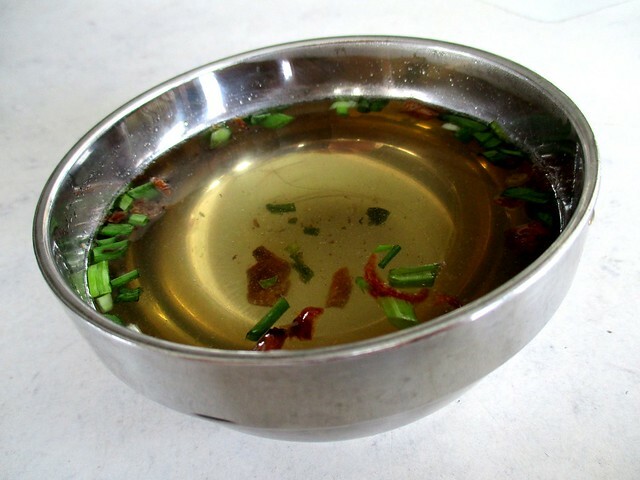 Thumbs up to them for using stainless steel bowl for the complimentary soup. They should do away with all the plastic bowls and plates. Some looks so dirty with the stain and yet they don’t bother to change. So far I have not seen plastic plates so old but still, I am not into those. Wish people would stop using it. After all, they are doing away with plastic bags, plastic straws. 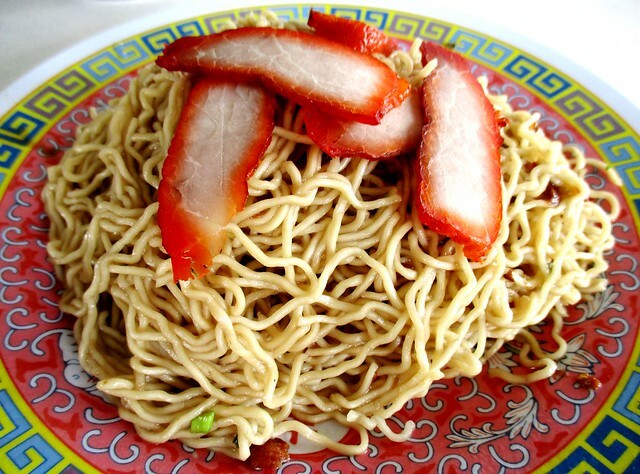 The char siew was dry?? Geez. It didnt lookes like it fron the photo. Melamime plate is better than plastic anytime. Lol. I read somewhere it is generally the same as plastic, not for hot foods. Ceramic is good as long as it is not chipped. Can’t stand the sight of chipped plates, may harbour germs! I hope you find something nice to eat thereon your next visit so that it would be worthwhile to return often since it is so near you. Whatever the guy was cooking behind the panel, it did smell good. Hopefully, I’ll get to try something worth dropping by for one of these days. Yes, we do have those here too…even bottled drinking water or the osmosis kind! Cut-throats!